Finally discovered this thread and figured I might as well contribute. Idaho, May 2007. Grizzly Bows 3-piece takedown, 55# at 28". 12 yard shot with a lam birch shaft tipped with a 190 gr El Grande grizzly (total wt 720 gr.). A hunt of a lifetime, made a great video too! Gregg job Vig, maybe you could post a little story how it all came togehter? Well, I have a video but I'm not sure if this is the "proper forum" for posting. I did post the pic with a little story on the daily hunt & pics threat on the Pow Wow. Thanks for the kind words! post the video, Vig! Do it here. Congratulations on the bear. They are really interesting and neat critters to hunt, for sure. Will check back to see the film. Maybe you could post the link to your powwow thread telling about the hunt so we could shoot over there from here? And now, the rest of the story... Many would agree that hunting over a bait is best in the evening (maybe it's easier than getting up early?). Well, we had plenty of proof of this little guy coming in during the day and since I only had 3 days to hunt I didn't want to miss any opportunities. So, I woke everyone up before daylight on my first morning in camp and convinced them to sit in the stands. My brother Mike left his bow at camp and just brought the video camera to sit with me, while my Dad sat another stand. We weren't in the stand for more than 45 minutes when all the action started to happen. Just when I thought the bear was going to become preoccupied with the bait and give me a shot we heard the crunching of branches behind us down the hill. The bear at the bait also heard the telltale signs of another approaching bear and quickly moved to investigate. When it stood broadside looking for the intruder (which could have possibly been a larger bear) I had a serious case of "what should I do now?" Learning from past experience, I decided to take the opportunity in front of me. Once that decision was made, the rest happened on its own. When it was all through and we returned to camp we found that my Dad had alreay returned and was taking a nap. I woke him up; he said he didn't see anything and asked if we had seen anything. I said, "only the bear that I double-lunged!" I'll never forget the way he flew out of that sleeping bag to congratulate me. The experience of this hunt was really incredible. 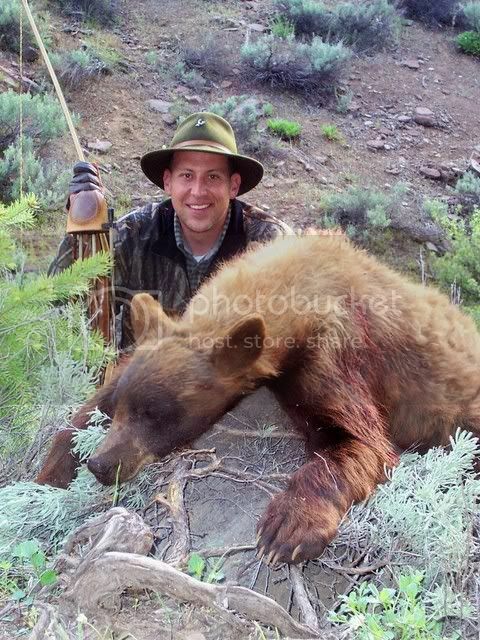 I thank God for the bear, the beautiful country, and for the love of archery and hunting He's given me and my family. If a picture is worth a thousand words, I think a good hunting video is priceless! I hope you enjoy. Love footage!! Beautiful color phase! Great video! Congrats on the bear. Congrats & great video !!! Awesome Vig, if that doesn't get your heart pumping your dead! That was great stuff! Congrats on your bear! "Dad, I need to sit down I'm shaking to bad" my 12 year old son the first time he shot at a deer with his bow.